Last week started out at a good clip: two comics with enough of a mathematical theme I could imagine writing a paragraph about them each day. Then things puttered out. The rest of the week had almost nothing. At least nothing that seemed significant enough. I’ll list those, since that’s become my habit, at the end of the essay. Jonathan Lemon and Joey Alison Sayers’s Alley Oop for the 20th is my first chance to show off the new artist and writer team. They’ve decided to make Sunday strips a side continuity about a young Alley Oop and his friends. I’m interested. The strip is built on the bit of pop anthropology that tells us “primitive” tribes will have very few counting words. That you can express concepts like one, two, and three, but then have to give up and count “many”. 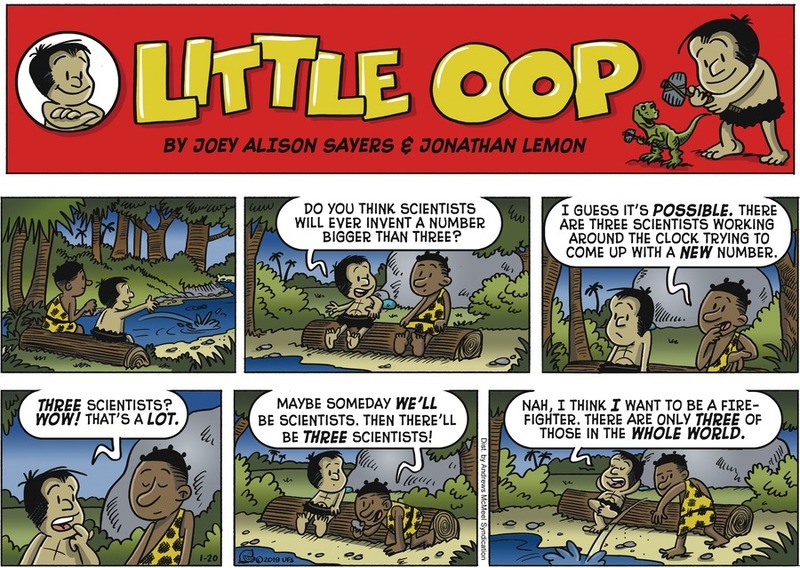 Jonathan Lemon and Joey Alison Sayers’s Alley Oop for the 20th of January, 2019. I don’t seem to have had much cause to mention Alley Oop before; the only previous reference I can find is in this cameo in a different comic. Well, this and any other essays that write about Alley Oop at any length should be at this link. I don’t figure to differentiate between the weekday Alley Oop strip and the Sunday Little Oop line in using this tag. Perhaps it’s so. Some societies have been found to have, what seem to us, rather few numerals. This doesn’t reflect on anyone’s abilities or intelligence or the like. And it doesn’t mean people who lack a word for, say, “forty-nine” would be unable to compute. It might take longer, but probably just from inexperience. If someone practiced much calculation on “forty-nine” they’d probably have a name for it. And folks raised in the western mathematics use, even enjoy, some vagueness about big numbers too. We might say there are “dozens” of a thing even if there are not precisely 24, 36, or 48 of the thing; “52” is close enough and we probably didn’t even count it up. “Hundred” similarly has gotten the connotation of being a precise number, but it’s used to mean “really quite a lot of a thing”. The words “thousands”, “millions”, and mock-numbers like “zillions” have a similar role. They suggest different ranges of what might be “many”. Zach Weinersmith’s Saturday Morning Breakfast Cereal for the 20th of January, 2019. Pretty much every Reading the Comics brings up this strip. But the essays that specifically mention Saturday Morning Breakfast Cereal should be at this link. The catch — well, one catch — is that this tempts one to reward a process. Once it’s taken for granted the process works, then whether it’s actually doing what you want gets forgotten. And once everyone knows what’s being measured it becomes possible to game the system. Famously, in the mid-1960s the United States tried to judge its progress in the Vietname War by counting the number of enemy soldiers killed. There was then little reason to care about who was killed, or why. And reason to not care whether actual enemy soldiers were being killed. There’s good to be said about testing whether the things you try to do work. There’s great danger in thinking that the thing you can measure guarantees success. Mark Anderson’s Andertoons for the 21st is a bit of fun with definitions. 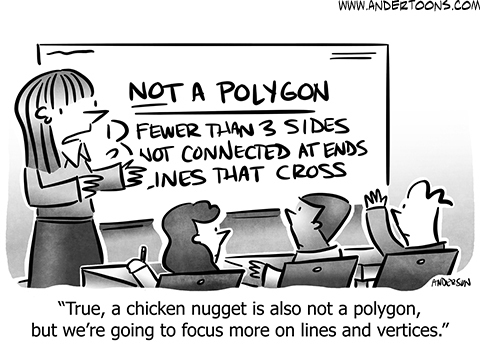 Mathematicians rely on definitions. It’s hard to imagine a proof about something undefined. But definitions are hard to compose. We usually construct a definition because we want a common term to describe a collection of things, and to exclude another collection of things. And we need people like Wavehead who can find edge cases, things that seem to satisfy a definition while breaking its spirit. This can let us find unstated assumptions that we should pay attention to. Or force us to accept that the definition is so generally useful that we’ll tolerate it having some counter-intuitive implications. Mark Anderson’s Andertoons for the 21st of January, 2019. Pretty much every Reading the Comics brings up this strip, at least since last fall’s weird gap has ended. But the essays that specifically mention Andertoons should be at this link. My favorite counter-intuitive implication is in analysis. The field has a definition for what it means that a function is continuous. It’s meant to capture the idea that you could draw a curve representing the function without having to lift the pen that does it. The best definition mathematicians have settled on allows you to count a function that’s continuous at a single point in all of space. Continuity seems like something that should need an interval to happen. But we haven’t found a better way to define “continuous” that excludes this pathological case. So we embrace the weirdness in exchange for general usefulness. Charles Brubaker’s Ask A Cat for the 21st of January, 2019. Although I’ve mentioned this comic before, it wasn’t when I was putting up tags naming each comic. I’ll fix that now. This and future essays mentioning Ask A Cat (or its Fuzzy Princess sideline, as long as that hasn’t got its own GoComics presence) should appear at this link. And this strip previously ran the 19th of June, 2016. Charles Brubaker’s Ask A Cat for the 21st is a guest appearance from Brubaker’s other strip, The Fuzzy Princess . It’s a rerun and I did discuss it earlier. Soap bubbles make for great mathematics. They’re easy to play with, for one thing. That’s good for capturing imagination. And the mathematics behind them is deep, and led to important results analytically and computationally. It happens when this strip first ran I’d encountered a triplet of essays about the mathematics of soap bubbles and wireframe surfaces. My introduction to those essays is here. Benita Epstein’s Six Chix for the 25th I wasn’t sure I’d include. But Roy Kassinger asked about it, so that tipped the scales. The dog tries to blame his bad behavior on “the algorithm”, bringing up one of the better monsters of the last couple years. An algorithm is just the procedure by which you do something. Mathematically, that’s usually to solve a problem. That might be finding some interesting part of the domain or range of a function. That might be putting a collection of things in order. that might be any of a host of things. And then we go make a decision based on the results of the algorithm. Benita Epstein’s Six Chix for the 25th of January, 2019. The essays wherein I mention Six Chix , from any of the shared strip’s authors, should appear at this link. What earns The Algorithm its deserved bad name is mindlessness. The idea that once you have an algorithm that a problem is solved. Worse, that once an algorithm is in place it would be irrational to challenge it. I have seen the process termed “mathwashing”, by analogy with whitewashing, and it’s a good one. The notion that because something is done by computer it must be done correctly is absurd. We knew it was absurd before there were computers as we knew them, as see anyone for the past century who has spoken of a “Kafkaesque” interaction with a large organization. It’s impossible to foresee all the outcomes of any reasonably complicated process, much less to verify that all the outcomes are handled correctly. This is before we consider that there will always be mistakes made in the handling of data. Or in the carrying out of the process. And that’s before we consider bad actors. I’m sure there must be research into algorithms designed to handle gaming of the system. I don’t know that there are any good results yet, though. We certainly need them. There were a couple comics that didn’t seem to be substantial enough for me to write at length about. You might like them anyway. Connie Sun’s Connie to the Wonnie for the 21st shows off a Venn Diagram. Hector D Cantú and Carlos Castellanos’s Baldo for the 23rd is a bit of wordplay about what mathematicians do. Jonathan Lemon’s Rabbits Against Magic for the 23rd similarly is a bit of wordplay built around percentages. (Lemon is the new artist for Alley Oop .) And Keith Tutt and Daniel Saunders’s Lard’s World Peace Tips features Albert Einstein, and a joke based on one of the symmetries which make relativity such a useful explanation of the world’s workings. I don’t plan to have another Reading the Comics post until next Sunday. But when I do, it’ll be here.